A knitted toy dinosaur must completely unravel itself to save the love of its life in one of the most impressive stop motion animations of the year. A 2019 Annie Award nominee. As children’s media gets brighter, louder, faster (and frequently, more annoying) what’s being lost? Maybe it’s anecdotal, but now that I have a kid of my own and a chance to sample contemporary offerings, I wonder where is the menace, or the heartbreak in them? You know, the challenging, scary, weird, borderline age-inappropriate stuff that to me seemed such a hallmark of some of the best children’s media of previous generations. I don’t think that we should require a pedagogical component to entertainment, but I certainly used media to learn about the world and myself at a young age, and cherish some of those difficult experiences that really upset or bewildered me at the time. I’m reminded about that when watching Lost & Found, a remarkably crafted stop-motion animation out of Australia that debuted yesterday online, and which is in the running for both a 2019 Annie Award, and Oscar. Lost & Found is a simple story. 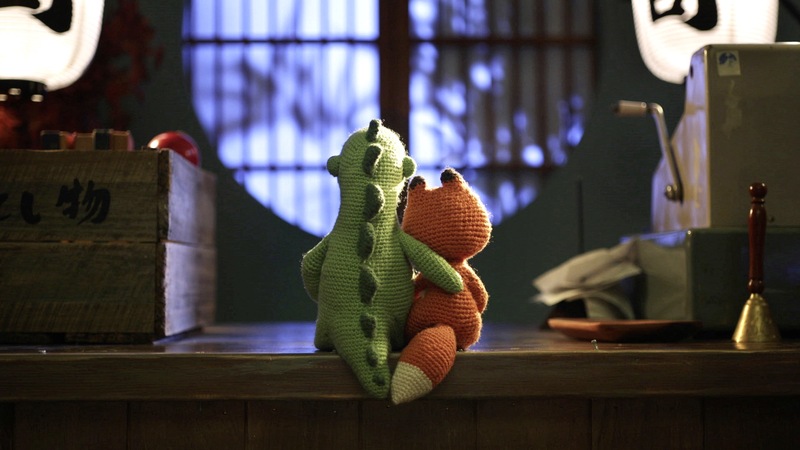 Two crocheted stuffed animals are in love, and when Fox finds itself in danger, it’s up to Dinosaur to risk everything to save its partner. The bulk of the 8min film is thus an extended action sequence, and in this simplicity it reminded me of the stripped down, locked-in focus of the classic French CG chase sequence shorts we enjoyed in the wake of Oktapodi. The genuine stakes of Lost & Found though, its themes of sacrifice and loss, introduce a new, heightened emotionality to this formula however, and can ultimately prove to be quite upsetting to young kids (and us big kids too!). Honestly in reflection upon the tragic plot, there’s not much to qualify the film as a children’s entertainment aside from the cutesy choice of characters, so perhaps my entire intro should be disregarded! Directors Andrew Goldsmith and Bradley Slabe credit the melancholy of their work to being inspired by Wabi Sabi, a Japanese philosophy that seeks meaning through an “acceptance of transience and imperfection”, and the ending in particular strikes a nice balance between hope and a sense of the elegiac. Originally part of a triptych of stories that Slabe pitched through a picture book (which also included two sushi pieces falling in love, and two bonsais learning to let go), Lost & Found is, like many animated shorts, dialogue-free. But, within that limitation, the pair do a great job of fostering a connection to the characters through both the expressiveness of the animation and the emotional arc of the plot, resulting in an experience that has a good chance at sticking with you. This wedding of raw craft and storytelling is quite mature here. Generously funded by Screen Australia, we’re used to stop-motion being a contained craft, executed with models in small spaces, but this film is on a different scale entirely. The character animation is incorporated into a life-size sushi restaurant set that was built from scratch, and this decision pays off in the impressive camera direction that results—the production is able to go wide and really play with perspective and depth of field in a way that is rare for the form. Goldsmith is an accomplished commercial director with wide-ranging experience in live-action and CG, and is able to use his visually creativity to the utmost via custom motion control hardware and software designed by Cinematographer Gerald Thompson. Small details, such as the animation of water, string, and the puffs of stuffing, will be a delight to animation nerds, and if you’re among those, do check out the production’s short BTS video. Ultimately though we’re just fans of work that both appeals to kids, but can also make them cry (maybe that says more about us). Premiering this year at the Berlinale, Lost & Found has had a light, but prominent festival run, with notable awards at Sydney and Austin along the way. Being one of 5 nominees for the upcoming Annie Awards alongside S/W featured films Solar Walk and Pépé le Morse is something of a surprise however, and is quite an honor—we’ll be wishing all 3 productions luck come February, and in their chances for Oscar. As for next steps, Goldsmith says that there is interest in pursuing longer-form projects in both stop mo and other animation formats.